Floyd Mayweather will fight six bouts over a 30-month period that could make the eight-time world champion the richest individual athlete in the world. 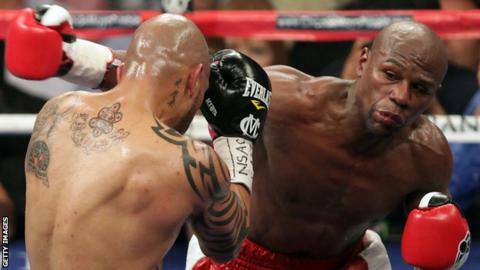 The 35-year-old will fight welterweight Robert Guerrero in the first of these bouts on 4 May. "Mayweather's new deal is by far the biggest in the sport of boxing," said Mayweather's promotions company. The specific financial terms of the deal were not disclosed. The Guerrero fight will be Mayweather's first since beating Miguel Cotto for the WBA light-middleweight title by unanimous decision in May last year, extending his record to 43-0 (26 KOs). The American then served a two-month prison sentence for domestic violence before he was released on 3 August. The new television deal sees Mayweather, who holds the WBC welterweight and WBA light middleweight belts, leave HBO for Showtime. He averages more than one million pay-per-view buys per event - more than any other boxer. "At this record-setting PPV performance level, if all six fights contemplated by this deal occur, it will be the richest individual athlete deal in all of sports," added the statement from Mayweather's promotions company.